This often puzzling and frequently misunderstood book is presented with a refreshing approach that captures not only John’s hope for his first listeners, but implications for today’s believers. In selected passages, students find new ways to read an ancient vision that speaks about the past and the present, too, not simply the future. By interweaving the ancient world of the original John with the concerns of today’s church, this study helps learners see that Revelation does reveal truths to those seeking to hear its original message. Readers are challenged to study Revelation from the vantage points of the history, culture, original audience, and literary skills of its writers. For those eager to explore a new way of reading Revelation, this installment of the Annual Bible Study series provides a deeper appreciation for this most strange of New Testament books. The Smyth & Helwys Annual Bible Study includes a Teaching Guide and a Study Guide, written by Dr. David May, professor of New Testament at Central Baptist Theological Seminary. There are also many additional resources available, including two commentaries–one is a hardback Bible Study Commentary with CD-ROM written by Mitchell Reddish and the other is a literary commentary by Joseph Trafton. Further insight into the study of Revelation is provided with Making Sense of the Revelation by William Turner and Reading the Signs by T.C. Smith. The Revelation Teaching Guide includes five chapters focusing on teaching options, a suggested outline, approaches for leading discussions, a worship outline and includes the following themes: Biblical background, theological themes, literary themes, history of interpretation, spirituality and ministry themes. 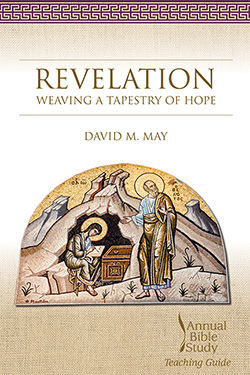 The Revelation Study Guide serves to educate the learner on major issues of appropriate interpretations, to offer an overview of theological themes, and to build the learner’s Bible study skills by considering several significant interpretations.